Looking for resources about electricity? I’ve gone down many rabbit trails to find the ones I think are the best. See below for videos, hands-on activities, computer games, card games, websites, books and occasionally a worksheet or two. Most of these resources are suitable for middle primary to lower secondary children. The articles at the end are mainly aimed at adults but would be suitable for children who are interested and who don’t mind reading at a high level. Please comment below if you tried and appreciated these resources, or if you have other resources which you recommend because you have used them before. To understand static electricity, try this video from How Stuff Works. Or watch the video below where Hank Green from SciShow explains electrostatics as part of his series on the Four Fundamental Forces of Physics. The Exploratorium in San Francisco has a great hands-on activity where you make an electrophorus – a device for storing charge. Or try some computer games. There seem to be a few computer games based on the idea of changing the charge on a particle to move it around a maze with charged obstacles. This one from Molecular Workbench has only one level. Make sure you press Run to get your game started! There’s another one from MIT here but I didn’t manage to get it to run on my computer. For more information about electricity, including static electricity, try Funology. This site is text based, but the images are also helpful. Also look at BBC GCSE bitesize – text with some animations. Very good explanations. Note that this site has been archived and it is possible that the BBC will not continue to maintain it at some point in the future. Here is a largely text based explanation on Explain That Stuff, with helpful images. The Electronics Club website is simply and clearly laid out and very helpful, particularly for understanding circuit symbols. In my class I used this handout on TES Australia (also on TES Connect), plus a key with relevant circuit symbols, to see if children could spot errors in simple circuits. Note: You have to register to get access to any TES resources, including the free ones. Hank from SciShow explains magnetism with lots of fast talking, not so many visuals. Try this ‘Circles of Magnetism’ activity from the Exploratorium. If you have enough magnetic compasses it is a great way to see the connection between electricity and magnetism. A World without Magnets is an infographic about the uses of magnetism. Once you realise that electricity and magnetism are two aspects of the same thing, you can use electricity to generate motion due to magnetic attraction and repulsion. Here’s Hank again demonstrating an extremely simple electric motor. Or if you want a slightly more complex one you could buy this one from Mad About Science. I know they say it is the World’s Simplest Motor but they clearly haven’t been watching YouTube as much as I have. Electric generators also make use of the interrelation between electricity and magnetism, using a moving magnetic field to generate electricity. Veritasium video of a very simple electric generator. I didn’t use the lesson plan above in my Nurture Learning classes. As I said in my last post, we played Energy Trumps cards in the class and I also suggested my students tried the Electrocity game online. The Energy Trumps game came from the Centre for Alternative Technology in the UK, so some of the categories are specific to the UK. I haven’t seen a similar resource for Australia, which is a shame. The link takes you to the CAT resources page. Scroll down to the Energy Trumps subtitle for pdfs of the cards and instructions. Electric Kids lesson plans and worksheets from Endeavour Energy, written to cover the NSW Science and Technology and PDHPE syllabus for Years 5 and 6 (Stage 3). 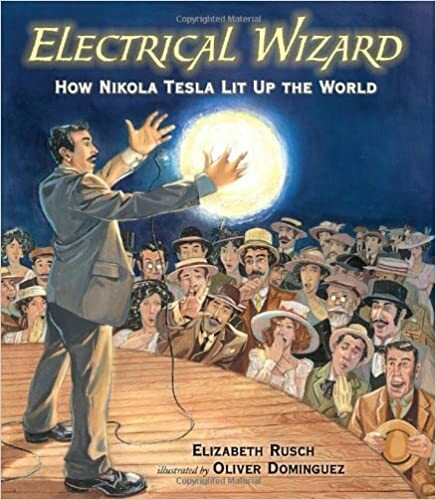 Electrical Wizard (How Nikolai Tesla lit up the world). Aimed at 7-10 year olds. The Manga Guide to Electricity. For age 9 and up. The Boy Who Harnessed the Wind Before William Kamkwamba’s determination to build a windmill for his village in Malawi, only 2% of Malawians had electricity or running water. This Young Readers Edition has been edited for children from about Grade 5 level upwards; there is another book with the same title aimed at children at high school.